Concordia Language Villages, a program of Concordia College in Moorhead, Minn., offers language immersion programs in 15 languages: Arabic, Chinese, Danish, English, Finnish, French, German, Italian, Japanese, Korean, Norwegian, Portuguese, Russia, Spanish and Swedish. Since 1961, youth ages 7-18 have experienced the excitement and fun of an international adventure at our flagship residential language and cultural immersion programs. No previous language experience is necessary, and all levels of language learners are welcome at our culturally authentic Language Villages. 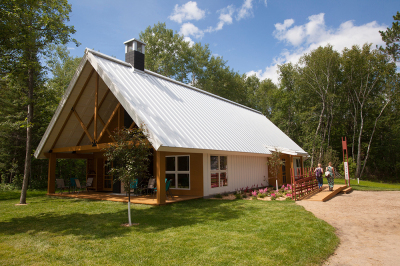 Each summer more than 4,000 young people from across the United States and around the world immerse themselves in language and culture at our beautiful locations in the Northwoods of Minnesota, including seven architecturally authentic sites. Charter transportation is available from regional airports, making travel easy and efficient for out-of-state campers. In recent years, 96 percent of parents surveyed said that they were “very satisfied” or “satisfied” with their children’s experiences at the Language Villages. What is a Language Village? A Language Village is both a place and a frame of mind. Unlike any other program of its kind, our participants, called “villagers,” take part in a grand simulation where they immerse themselves in the sights, sounds and tastes of a different culture. Villagers use the currency of the culture at the Village store, take on a new name, and live the language within the cultural context of another country. It’s more fun (and interesting) to speak French while eating baguette, or Chinese while eating dumplings. Everything that happens in the Village supports the language and cultural immersion principles. No other educational institution in the United States provides the level of cultural context that Concordia Language Villages offers. Villagers are introduced to Village life, are immersed in the language and culture of the Village, and develop the skills necessary for living independently while in a community of other learners. Appropriate for all levels of language proficiency. 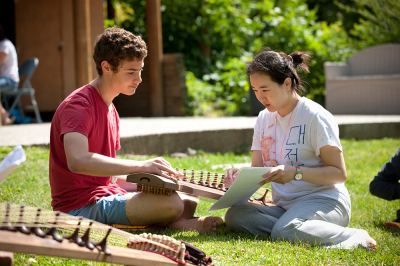 The original language camp, villagers develop strong relationships with staff and peers, learn about customs and traditions relevant to the language of the Village, and explore more complex topics or complete more challenging projects. Appropriate for all levels of language proficiency. All levels, from beginning to advanced, are offered. After successful completion of the program, participants are sent a transcript granting credit for one year of high school language instruction, written evaluation, and course framework. A college credit program is also available. Villagers enjoy fun games, craft activities and lots of music at our day camps. The day camps run for all language levels and are an exciting way to advance your children's language skills. Our Language Villages are an ideal opportunity to share an "international" experience together for a fraction of the cost of traveling abroad. Invite grandparents, cousins, aunts and uncles for an unforgettable family reunion! My daughter had never been to camp before. She loved the Chinese Language immersion camp. She did not know anyone going in but made what maybe be lifelong friends. The counselors and activities were great. She gained so much confidence in herself and in the Chinese language. Our daughter attended a 2 week camp at age 15, 4 week Folk High School camp at age 16 and plans to attend the 4 week High School Credit camp this summer, all in Norwegian. This is her favorite camp she has ever attended and she absolutely loves everything about it - the counselors, campers, language learning, activities and food. I like that she's engaged in learning, as well as having fun. I cannot overstate how passionately she loves this camp. I also have a high trust level for the program where they pick your child up from the airport, feed them dinner/breakfast and keep them overnight in a dorm, which our daughter used both times. My son, age 11, began attending the one-week sessions in French at 7 years of age. He has attended the Bemidji and Hackensack sites. Both experiences were extremely positive. My son is a bit reserved. The two weeks combined that he has spent at camp so far have fostered independence, confidence, his sense of humor, his love of nature, his appreciation for different foods and cultural values associated with meals, and meaningful friendships…and his French is not bad! From my point of view, the best thing about it is the community atmosphere and the fact that young people have the opportunity to build intergenerational relationships. There are as many adults on site as younger children, whether as camp staff or learners, and they are all joyous! I have both times been so grateful for counselors, mentors he recalls with great fondness the whole year through. It’s quite a remarkable community and experience. I have nothing but great things to say about Concordia Language Villages. Note, too, that they offer various kinds of really generous financial aid: don’t let cost be a barrier. After living in China for four years we returned to MN. It was difficult to keep our boys active in the Chinese Language. We decided to try Concordia. Well 3 years later my son absolutely loves going to the camp. We have no problem with getting him excited about the journey. He will be spending 2 more weeks there this summer. Summer 2015 our daughter attended Sen Li Hu Mandarin Camp at Concordia. She made friends all over the country, and remains in contact with them. The immersive experience gave her a lot of confidence when school started three weeks later. She will be returning again this summer before her sophomore year, and she says "go for it!" I recommend this camp with so much enthusiasm. The staff was caring and kind. The moment that you walk into the camp, you feel as if you are in a foreign country. My boys learned so much in a very short amount of time! Fantastic experience!! My kids (ages 10- Spanish camp & 13- German camp) both love Concordia Language Villages. They like the activities, food, culture and learning a foreign language. Our schools do not teach German, so my son may attend the high school credit program at Waldsee to fulfill his language requirement. The Language Villages offer a great opportunity for kids to have fun at camp, learn an important skill and gain appreciation for other cultures. Both of my daughters have attended the Spanish camp at El Lago del Bosque. My youngest (13) is attending this summer for the third time. 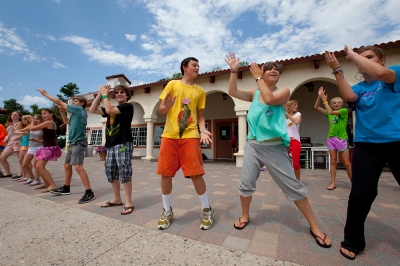 They love the camp - fun activities, great language instruction, and a perfect atmosphere for improving their Spanish. They rave about the facilities and the food. I have found the camp administration to be extremely professional and helpful. I feel very comfortable sending my daughter across the country to attend each summer, knowing she is learning, having fun, as well as safe and sound. We've had two kids attend El Lago del Bosque over the last 4 years, and am amazed at how much Spanish they learn each time. Neither of them attended an immersion elementary school, so we were nervous about them being overwhelmed and frustrated about not being able to communicate. No worries. CLV does an amazing job of making language immersion fun, and both of our kids were enthusiastic return campers. 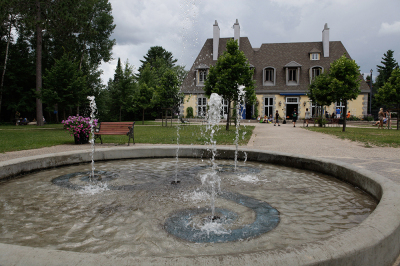 Our 15 year old son attended Lac du Bois, the French village, for 2 weeks in summer 2015. It was a real growth experience for him personally & linguistically. A year later he is still listening to French music he was introduced to & his 3 year old brother walks around singing in French. We can not say enough about the support of the camp counselors. They were engaged every step of the way. The 'theme for the day' was a great approach to teaching/learning. It was a great experience! Fantastic camp experience. Our daughters participated in the German (Waldsee) village week long camp. They learned some German and had fun with the variety of activities available at the camp. I had my 14 & 15 year old daughters at the camp last summer They are very different girls but both loved the camp and can't wait to go both this summer. They both went for the high school credit session and both did great. My daughter attended El Lago del Bosque for the first time last year. She was nervous the entire ride to Bemidji, not knowing what to expect and having mostly attended sports camps in the past. At the end of the week, she came running to us and, after the hug, her first question was, "May I please stay for another week?" She was so excited about the camp, the counselors, the language, and the friends she made. She sang Spanish songs throughout our seven-hour ride home. Her Spanish teacher commented on her increased excitement about the language and the many cultures they are studying. This year, she is going back for two weeks and is thrilled. I cannot say enough about this camp. My daughter has attended the German camp, Waldsee, for the past four years--first as a day camper, then a one-weeker, then twice as a two-weeker. It has been an incredibly important experience in her life. Not only has she picked up quite a lot of German, but she has been inspired to take a leadership role in the camp community and truly thinks of the place as a second home. She says she thinks about camp and misses it all year until she is back there again. In addition to language skills, the camp offers excellent experiences for personal development. My daughter participated last year in a specialty group, "the Green world," and learned canoeing, identifying flora and fauna, planning for wilderness excursions, etc. There are a number of these groups campers can choose from. We are so happy we learned about Concordia and anticipate that our daughter will attend every year until she becomes a counselor. If I had to pick one word to describe my experience at Skogfjorden (the Norwegian village) I would pick "transformative." I would not be the person I am today without the experiences I had there. It's very hard to describe my experiences there, but let's just say it's my favorite place on earth. My heart sings when I go back now, years later. And now my son attends (and soon my daughter will be old enough too) and I can see it is capturing his heart too. There is no place I feel more comfortable sending my kids. I know they will be safe and cared for and loved and they will learn and they will come home transformed. They will see the world with new eyes. My 12 year old daughter attended Mori no Ike, the Japanese language camp. She knew only a bit of Japanese, she felt she was able to increase her knowledge and apply it. She will be attending again this summer, she loved the experience. It's the closest thing to actually going to Japan, with the food, culture and activities! My 12 year old daughter went to the French immersion Bemidji camp in the Summer 2015. She had a fabulous experience and acquired an immense amount of French. She is still recognizing words today, some 9 months later, that she learned at camp. She attended an International Day session and would highly recommend it. Our compliments are endless for the language, the fun, the counselors, and the food! Both of my sons have attended Skogfjorden, the Norwegian language village. They loved every minute. The camp stresses outdoor time, with learning the language and about the culture, all in a fun, interactive way. They have a great time and learn in the process, what could be better? My daughter has been to the Chinese weeklong language immersion camp here four years running. She loves it and asks to return yearly. The transportation options are great to help get your kid there--they will meet a minor at the airport, arrange charter bus, however you want, it works well and is organized. No technology allowed, all cell phones ,just be turned in on arrival at camp! My 12 year old son attended the two week Swedish immersion camp in 2015. He came home with more Swedish language skills/knowledge than I would have thought possible in just two weeks, not to mention an enhanced understanding of and appreciation for Swedish culture, music, food, etc, and many new friends from around the country. He is already looking forward to his return this summer. Norwegian/Skogfjorden: A perfect mix of trying new foods, activities, adventures, and having a blast meeting peers from different places who loved the same things I did, Skogfjorden Norwegian Language Villages was an amazing experience. I took a chance on the village as a shy teenager, and attended for merely two years, without any prior knowledge of the language in which the village immersed me. Wonderful staff, a welcoming atmosphere, and a landscape to cultivate an attitude of lifelong learning and new skills! My 3 daughters have all attended the French language village for several years. They love it! They learn tons of French and have a lot of fun at the same time. They gain a tremendous appreciation for our global community and different cultures. The Hackensack site is a rustic and truly gorgeous camp. Kids get a chance to have traditional camp experiences there. The staff is very professional, knowledgeable and fun. Highly recommend this program! My daughter went to the Korean camp hardly knowing any Korean. She was warmly welcomed by the professional staff who helped her start from where she was. She made many good friends and developed confidence in her language ability. My kids went to a spanish immersion school and we were looking for an opportunity for them to continue their Spanish and gain some independence. The kids are grouped by ability and the higher level groups are usually taught by a native speaker. They did a good job of getting the kids to speak Spanish, learn new things and stay engaged. The counselors were great. Supportive and made a good connection with the kids Overall a great experience! Our kids attended for multiple years. My daughter has attended the Swedish village at Bemidji for the 2 week immersion for the last 2 summers and has absolutely LOVED IT! She's kind of a shy girl, but she seemed to open up there! I didn't know how much they'd actually learn in 2 weeks, but she came home speaking Swedish and kept at it throughout the rest of the year! The friends made there stay in touch through text and email through the year as well. When I picked up my daughter the first year, we hugged and the VERY FIRST THING she said to me was "I'm totally coming back next year!" Then, "the food here is sooo awesome!!!" The village is beautiful! And they have built each village to replicate a bit of the country they're visiting. I was VERY IMPRESSED with it! You can write to your child(ren) while they're there, either via snail mail or sending them an email through the village site. The village keeps a daily blog of each day at the village, so you can see what they're doing, their happy faces, what they've made, what they're eating etc. I'm a single mom and Concordia afforded my child the opportunity to attend camp through their scholarship offerings and we couldn't be more appreciative of that! I have, and continue, to recommend Concordia Language Villages to anyone looking for a positive summer experience for their child. I went in nervous but came out with knowledge, new friends and another "home" called Mori no Ike. My camp was in the woods near a lake, a beautiful setting. I have studied Japanese for a few years but it was great to be immersed in the language and culture. Luckily, I was a scholarship recipient and am very thankful of that to experience this camp. My daughter has attended the Japanese camp run by Concordia Language Villages for three summers. She eagerly returned each year because the staff were terrific! They made the language learning fun. My daughter flew in alone and Concordia staff was great in making sure that she was well cared for even when her flight was significantly delayed. I highly recommend this program. My 13-year-old daughters have attended the Language Villages for 4 summers. They have learned so much each session and loved actively exploring many interests, all in the context of Norwegian language and culture. Throughout the school year they wait impatiently to return . The staff is caring and supportive and creates a positive and fun atmosphere. Excellent experience! Our son attended a two week session in Spanish at the Bemidji site last year. His Spanish improved tremendously, he learned a lot about cultural and international issues related to the Spanish-speaking world, and he had tons of fun. He is returning this year for the four week credit session. My daughter has attended Lac du Bois for the past two years and is looking forward to her third session there this summer. She has loved every aspect of her time spent at French camp - from the friends she has made, the campus and cabins, the counselors, and even the food! My daughter Skye (14) has been at Skogfjorden (Norwegian language camp) five times now and will go back again this summer - she absolutely loves it there! Her Norwegian improves by leaps every summer and she comes back with the best stories ever. I am also impressed by the life-long friendships the villagers make, such a sense of community that goes beyond the language camp. I have met many alumni here in the DC area recently who are closely knit even today, 10-15 years later. 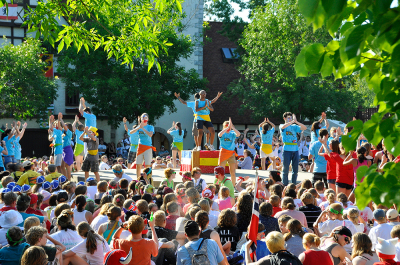 Concordia Language Villages are such a unique summer camp experience. My daughter has attended El Lago del Bosque in Bemidji for several years. It's a very supportive environment where kids with all levels of language ability are made to feel comfortable, but encouraged in positive ways to continue their language acquisition. 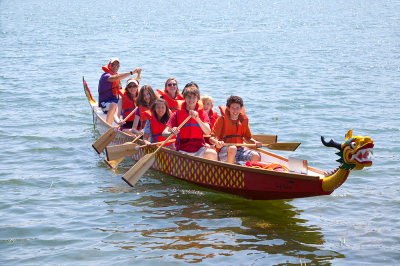 The facilities are fantastic and many traditional camp activities are available. She loves the food here, and the special traditions. I highly recommend CLV as a summer camp with an academic bonus. We live in the Caribbean and every summer travel to the U.S. My son has attended Concordia Language camp for four years in a row. The first year he went for two weeks and loved it at Lac du Bois. The next two years he did two weeks at El Lago de Bosque and the next two at Lac du Bois. The counselors are encouraging and inspiring. My son decided to attend the four week high school credit last summer. His goal now is to become a summer "mono" at the French camp. Going to camp has built his self confidence tremendously. I must say this has been money well spent! A true investment with immeasurable return. My 3 children have attended Concordia Language Villages for the last 6 years, both Japanese(Mori no Ike) and Spanish(El Lago del Bosque). Our son started at age 7 with Japanese and has requested to attend every summer since. At age 11 he requested to attend 2 two week sessions and it was granted. Another daughter attended the 4 week high school credit camp and loved it. PS We live in California. I had three daughters attend Concordia Language Villages 7-8 years ago and they all had a great time and learned a lot. My fourteen year old son went for the first time last summer and it was a fabulous experience for him, too. He plans to return this summer to the Bemidji site. I brought my children up speaking Spanish in the home but as the years have gone by, English has taken over as their dominant language. But they have retained their Spanish somewhat and being at these camps has helped them use and refresh their Spanish skills. The staff are friendly, knowledgable and helpful to all the campers! It's a great way for mainstream kids, too, to get out of their comfort zones and meet a lot of new people from different backgrounds. This Summer will be the third time in a row that my daughter (16) has attended the 4 week high school credit Korean language camp. Her mastery of Korean and Korean culture triples each time, according to her tutor. She thoroughly enjoys the mix of studying and culture immersion, has made firm friends, and is loathe to return home at the end of the camp! I could not recommend Concordia more highly to those that want meaningful, fun and challenging language immersion. Our daughter is somewhat shy and cerebral and going to this 2-week immersion camp was a big step for her. But oh my goodness! The results were fantastic! SHE LOVED IT and has been back for a winter weekend refresher since. The staff are very caring, the food very good (including considerate of vegan and vegetarian choices), and the boost to her conversational ability in French was amazing! We highly recommend Concordia Language Villages. It is sooooo worth the price! Our son attended for the first time last summer and had a fantastic time! The immersion into the French language was such a rewarding experience that he has decided to continue French in his high school years. He has made lasting friendships with campers from all over which is wonderful. This camp is so rich in culture and fun that he can't wait to go back this summer. Our 14 year old had a great experience. We knew it was right when she wrote home to say she dreamed in Spanish for the first time. Everything about Waldsee is wonderful! My son will attend for a 4th time this summer. The combination of outstanding people, engaging activities and great food make it a super way to learn German and enjoy summer. Both of my kids went to Concordia Spanish camp for at least 5 years. They told anyone who asked that it was their favorite place in the world. They made friends there from all over the country that they have stayed in touch with long after camp. The structure is based on using a new language to have fun. It's the songs and the skits and the activities all done in Spanish that make it much, much more fun than Spanish class in school. And, let's not forget about the food. Food is a heavyweight human motivator and Concordia understands that. Meals are delicious and culturally appropriate. The kids look forward to the food every year and anticipate their favorites. All in all, Concordia is one of the experiences I'm so happy that I as a parent was able to give my children. My 15 year old son has made lifelong friends at Concordia! The perfect place for an active, intelligent boy who has endless energy - they kept him busy 24 hours a day with music, art, and all the usual camp activities. Rave reviews from his Spanish teacher, my son skipped an entire year of HS Spanish after the two week summer program. Amazing! March. 23, 2016 by IngridS. These camps are absolutely amazing. Our children have attended Skogfjorden (Norwegian) and El Lago Del Bosque (Spanish) camps, and they acquired amazing language skills while having a blast. The counselors and staff are dedicated and have boundless energy, and the kids who go to these camps are kind and eager to learn while having fun. Everything is done in the target language, from the moment you drive up to the camp entrance, for a full immersion experience. It is worth every penny (and the scholarships are very generous!). Sending your child to these camps is a gift (language and fond memories) you will give them for life. Lac du Bois is a magical place. As a kid, it fulfilled my dream of discovering French words and food and customs, and of finding other people who were as excited about language and culture as I was. Now my daughter loves it for the same reasons-- unlike school, it is a place where she is allowed to be fluent in French (we lived abroad for a year), where she can bond with sympathetic counselors with similar interests, and make new friends and help them with French, feeling affirmed in the process. She loves the afternoons of free time going to the bank, shopping for chocolate, chatting with friends at the café, doing an art project. We decided to send her there instead of taking her back to France last summer, and putting her in a French school again-- at Lac du Bois, she gained a love of French through songs, skits, food, and caring people which she did not get as a foreigner trying to integrate into an unfamiliar school. Good choice. Concordia Language Villages was an awesome experience for my son. He was 10 years old when he went and I was extremely happy with the level of support and the programming. I would highly recommend this camp from both an academic and social aspect. Our children love Concordia Language Village. Our daughter has attended 4 summers and our oldest son for 10. They are both headed back this summer and counting down the days until camp begins. Our son is looking forward to his second session of High School language credit. This experience is the highlight of the summer for our kids. The staff is exceptional and through their fun and passionate instruction our children have developed language proficiencies and a keen understanding of the global society in which we live. We are beyond pleased with the experiences they receive and the return on all of our investment. Thank you Concordia College for providing this enriching language immersion experience. Concordia Language Villages will remain a special part of their childhood and hold a place in all of our hearts forever! My daughter and I attended the Family weekend camp which lead her to do the one week Japanese camp. She loved it and will be going this year for two weeks. She made friends she is still in touch with and they are all going this year to Japanese Camp. She has learned so much just in the one week camp. My daughter, aged 15, has attended Waldsee, the German-language camp at Concordia, two different years and she now plans her whole summer schedule around it. She has had wonderful experiences there and made friends she keeps in regular contact with the rest of the year. I have also been amazed at the amount of German that she has picked up in such a short time--I would say as much or more as she learns in a semester of high school German. Also, we live two states away and she flies on her own and is met by Camp staff and that has always worked seamlessly. This is a GREAT camp and a great experience for your child or family. 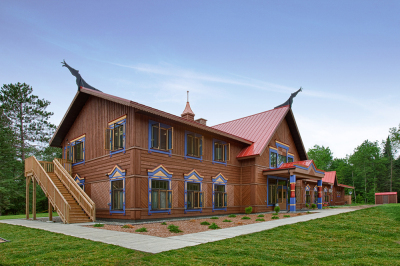 Sending my 11 year old away to camp was a big decision especially when she picked Concordia Language Villages which is in Minnesota (we live in Pa). When I went to pick her up her first words were, "I missed you so much mama and I want to come back--my session is the first two weeks of August next year." She will be coming back and she loves Swedish so much now she has a tutor and is planning to study abroad in 10th grade. Great experience, I highly recommend. Our children love attending Concordia Language Villages. Our oldest son will be attending this summer for his 11th year, second time for High School language credit. This experience is a highlight of the summer and they both look forward to the next camp session from the moment they depart until the moment they arrive. The quality of language and cultural instruction is outstanding and the credentials of the program staff are exceptional. Our children have connected with the culture and over the years developed near fluency in their chosen language. We are beyond pleased with the return our children receive from their participation and our investment. Thank you Concordia Language Village for being a special part of their childhood and instilling in our children a passion for language learning and a global appreciation for the world in which we live! Our son and daughter have been going to Concordia for three years now. They love it every time they go and are looking forward to returning this year. My son LOVED his Chinese camp. A full immersion program, that he prospered in. it is a lovely area, and the people all supportive to help students learn more. While he had the language in school, to have full day grew his abilities greatly. We are headed back this year as well! And he cant wait! thanks for having such an incredible opportunity! My oldest daughter has attended Sjolunden for the past 3 summers as a credit student. Her experience every single summer was amazing. The complete immersion into the culture has definitely impacted her in so many ways. Not only has she become proficient in another language, she has become a confident young adult who believes in herself. She has developed life long friendships, become open to new experiences, compassionate toward others and their culture. I am amazed at the kindness and willingness of the staff to do whatever it takes to make the CLV experience a positive one for every single villager. I have a shy daughter who first (reluctantly) went to camp as a 12-year -old. She loved it and will be coming back for her fifth year in 2016. The leaders, the activities and the other kids made this a welcoming experience for her. (The fact that it was educational doesn't hurt either.) I highly recommend CLV.